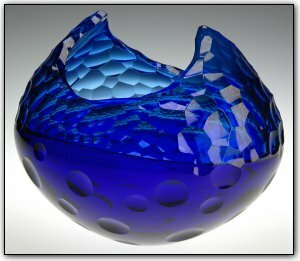 This blue lens cut bowl is referred to by the artist as a Rhapsody. The ultimate goal of a Rhapsody is to take a functional vessel and transcend it into a sculptural object, and still preserve its functionality. It requires many complex techniques to achieve a finished product that is elegant, modern, and innovative. This exploration is achieved by variation on form, color, and transparency of each vessel. Make sure to zoom in and see the details and textures in this one of a kind Rhapsody!